In 1963, the first US-based national Islamic organization – the Muslim Students Association (MSA) – was created by the Muslim Brotherhood at the University of Illinois, Urbana. In the early 1980’s the U.S. Muslim Brotherhood created the Islamic Society of North America (ISNA) as the next generation of the MSA – headquartered in Plainfield, Indiana – as the “nucleus” of their Islamic Movement to lead and coordinate all of the U.S. MB organizations created over those first 20 years. In November 2001, the largest Islamic charity in America – the Holy Land Foundation for Relief and Development (HLF) – was indicted by the U.S. government after a 15 year FBI investigation and convicted in 2008 in the largest terrorism financing and Hamas trial ever successfully prosecuted in American history for funneling millions of dollars to the terrorist group Hamas. HLF was the largest Islamic charity in America and it was a terrorist organization. Specifically, it was a Hamas front. Hamas is an inherent part of the Muslim Brotherhood. 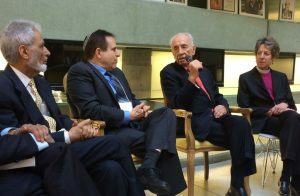 Hamas is essentially the Palestinian MB, and is a designated Foreign Terrorist Organization per the U.S. government and several other governments. In the HLF trial, ISNA is: a named un-indicted co-conspirator; identified as a Muslim Brotherhood organization by the Department of Justice; and was identified as a funding source for Hamas. Monies went directly from ISNA’s accounts to Hamas leaders and organizations overseas. Yesterday, it was revealed the Canadian government pulled the charitable status from ISNA Islamic Services of Canada as well as another Muslim Brotherhood group – the Canadian Islamic Trust Foundation. The two groups lost their charitable status for providing money to the Relief Organization of Kashmiri Muslims (ROKM), which is a charitable arm of Jamaat-e-Islami, a jihadi group. Four years ago, Canada revoked the charitable status for the ISNA Development Foundation for funding Pakistani jihadis in the Kashmir region. ISNA is the largest Islamic organization in North America and, coincidentally, the largest Muslim Brotherhood organization in North America. The MB’s own documents identify it as the “nucleus” of their Movement here. The Department of Justice identifies ISNA as a Muslim Brotherhood organization funding the terrorist group Hamas. 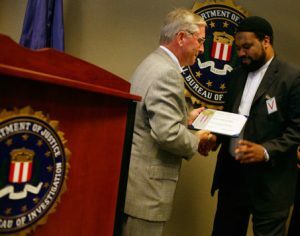 Up until recently ISNA was involved in certifying Muslim chaplains for the Department of Defense and Bureau of Prisons. 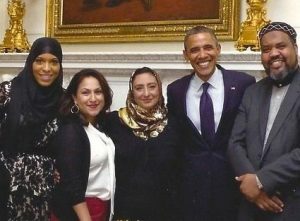 Under the Obama administration, ISNA’s previous President Mohamed Magid: sat on the Homeland Security Advisory Committee and held a secret clearance; gave lectures at CIA headquarters; was given an award by the FBI’s Washington Field Office (2005); was given the FBI Director’s Award by Director Comey in 2016; worked, along with his senior directors, directly with several Secretaries of State, including Mrs. Clinton and Mr. Kerry; was publicly lauded by President Obama’s Deputy National Security Advisor/Chief of Staff Denis McDonough; was publicly praised by President Obama who made a congratulatory video for ISNA’s annual conference two years ago; and participated in President Trump’s Inaugural Prayer Service at the National Cathedral (see UTT’s video of that HERE). 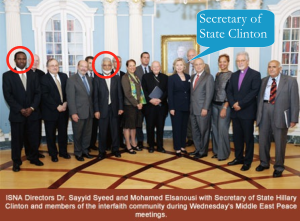 Today, ISNA’s National Director Sayyid Syeed (from Kashmiri, India by the way) can be found walking the halls of Congress, meeting with national Christian and Jewish leaders, and helping drive the Muslim Brotherhood’s Civilization Jihad as far as he can. Remember, the MB’s stated objectives – per their by-laws – is to establish an Islamic State under sharia. This is the same goal as ISIS, Al Qaeda, and all the other Islamic “terrorist” groups in the world. ISNA has over 300 subsidiary Islamic Societies in the U.S. today that are necessarily hostile to the communities in which they exist. Despite what they say, ISNA-Canada is directly aligned with the ISNA offices in the United States. In case you missed it, they are the Islamic Society of North America. Everyone who swears an oath to support and defend the United States Constitution has a legal and moral duty to oppose and shut down ISNA’s efforts by all means necessary. Furthermore, the individual in Hawaii currently laboring under a megalomaniac illusion that he has unilaterally reversed a unanimous decision of the U.S. Supreme Court involving sharia-adherent Muslim immigration issues under the singular Constitutional control of the President, is an impostor. I.e., he was illegally “nominated” to become a federal judge by a Kenyan born Islamist impostor who having knowingly failed to meet the presidential eligibility requirement of Article-2, section-1 of the Constitution, usurped the American presidency for eight years under false pretenses involving a demonstrably 100% counterfeit Hawaiian birth certificate and (thus) concomitant perjury. Too, lest you’ve forgotten, those 2996 merciless murders of (mainly) American citizens by Islamic jihadists on 11 September 2001 constituted the opening salvo of an arguably-preventable on-going war of survival which in the sole interest of a handful of elitist-immune treasonous liars has remained covered-up ever since. Thus, in addition to demanding that the 9/11 Commission be reconvened for the binary purpose of finally revealing the truth, and prosecuting said contextual bandits, every free minded American would be well advised to read what horrors the 7th century “global Islamic Movement” – IN THEIR OWN WORDS – has planned for they and their significant others. (I.e. for an actual copy of evidence seized by the FBI from a subterranean basement in Annandale, Virginia which was used as evidence in a U.S. District Court Muslim Brotherhood [terrorist organization] money laundering trial in Texas, contact: http://www.securefreedom.org and (for a nominal handling fee) request GOVERNMENT EXHIBIT 003-0085/3:04-CR-240-G U.S. v. HLF, ET AL. Here in Canada, the primeminister Trudope is a traitor to the country and should be remove from there.”impeech?” (Excuse my french). Those muslims only have one goal and it’s the planet. They are invading, sneeking in with Trudope’s help and the fact that the majority of people don’t want to see or get involve in stoping that ”plague” that is worst than ”aids”.